I’m no expert, Mark, but this seems to be your classic fried chicken sandwich. 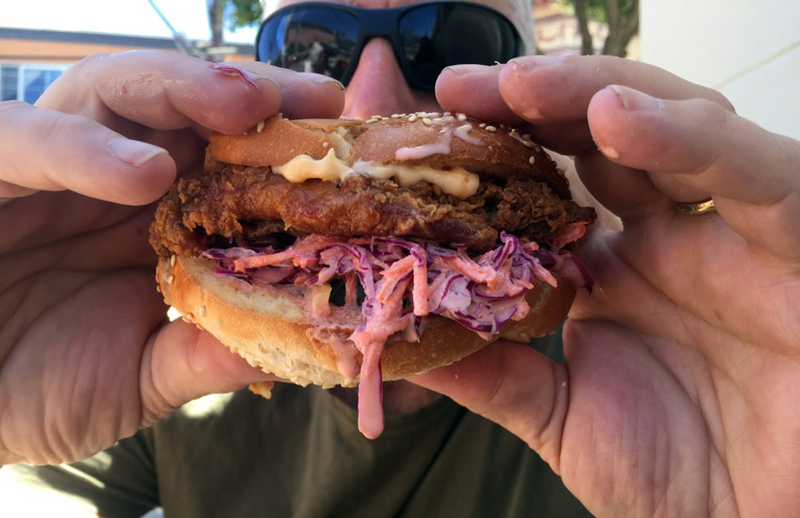 It has the slaw, the mayo, and of course the fat slab of fried chicken, which made the sandwich stand a towering four inches off the plate. That didn’t mean it was cumbersome — in fact, it was quite comfortable to eat. Slightly unnerving, however, was the Pepto Bismol-colored juice that spewed out of the sandwich and onto my hands at first bite. That must be what happens when purple cabbage coleslaw collides with chili aioli. The chicken was crunchy and tender and hinted with a perfect amount of spicy-sour Buffalo flavor. Some parts were a little burned, giving the chicken, at times, minor notes of “Safeway hot case.” That’s never the end of the world (I love fried-food hot cases), but when you remember you paid more than $10 for a sandwich that’s no bigger than your hand, you have to wonder. The owners of the Salumeria were sitting next to me as I ate, so I took the opportunity to ask what their batter recipe was. They said some Aleppo pepper, fennel pollen, coriander, black pepper and buttermilk, which mingles over a 24-hour period. The chicken, they said, is twice-breaded with the batter for the extra crunch. I give it three and half “chirps” out of four, you? That’s the way it was in the Mission back in the day. We had cashew chicken, broasted (!) chicken, mole chicken and Pollo Supremo. But no fried chicken (we won’t count the Colonel’s old hangout on Valencia and Hill — though fried, no one dare call it “chicken”). Once a fried-chicken wasteland, the Mission 4.0 now cackles with fried chicken on every block. Now we got more fried chicken per capita than burritos. If it wasn’t for Oakland, the Mission would be the fried-chicken capital of Northern California. Julian, you live and work at ground zero of a historic transformation. So I am shocked — and mildly amused — to hear you sing the praises Salumeria’s soggy sandwich. First of all, it’s considered bad form in fried chicken circles to swoon over your first sandwich. There is context to consider. Also history. Unfortunately, the slaw also undermines the taste, overwhelming not only the batter, but the chicken itself. Nice try, Julian, but you need to get out more, eat more fried chicken. Can we ever get enough (a question we’ll be exploring)? There are no end of options. Undreamed of marvels await you. Cross the street to Rheas and you will find the best fried chicken in the Mission. Excellent suggestion…something to look forward to. Rhea’s fried chicken is of the Gods, especially when hungover. Can’t recommend it highly enough. Good luck. Rhea’s hours make it almost impossible to go. I love the fried chicken at West of Pecos on Valencia between 16th and 17th. It comes with delicious sides of mashed potatoes, steamed spinach, and creamed corn. If Hog and Rocks is selling the same fried chicken they sold at Maverick, you gotta get you some of that. But this list must include the fried chicken from the stabby gas station at South Van Ness and 17th. “That’s the way it was in the Mission back in the day. We had cashew chicken, broasted (!) chicken, mole chicken and Pollo Supremo. But no fried chicken (we won’t count the Colonel’s old hangout on Valencia and Hill –” Have we forgotten about the Popeye’s on 22nd and Mission already?! ?